BMW has teased its new X3 M and X4 M models prior to their full reveal at the Geneva Motor Show next month. 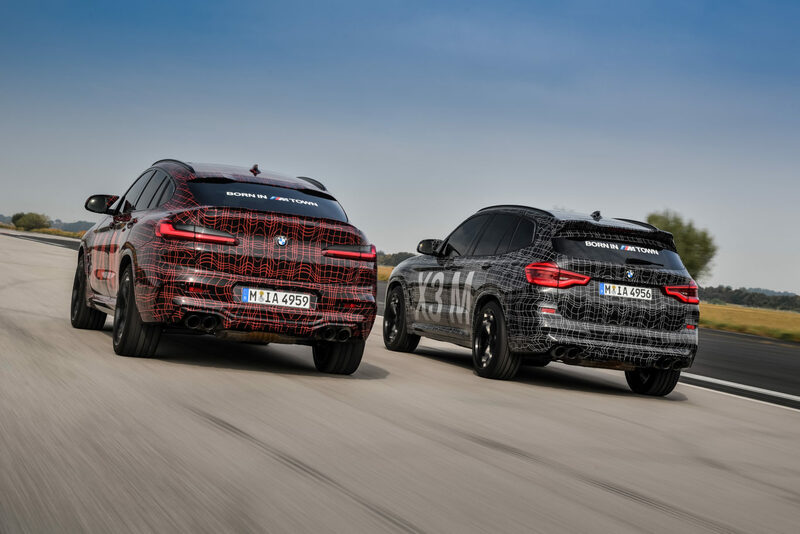 Pitched as rivals to the Porsche Macan Turbo and Alfa Romeo Stelvio Quadrifoglio, the pair have been showcased in a short video posted to BMW’s social media channels. The X3 M and X4 M are expected to utilise a twin-turbocharged six-cylinder petrol engine, which are expected to produce in the region of 425bhp. Power will be sent to all four wheels via BMW’s xDrive all-wheel-drive system. This engine is similar to that used in both the M3 and M4 sports cars, albeit in a slightly different state of tune. The video shows, despite heavy camouflage, both cars will feature flared bumpers and more prominent exhausts. Alongside these enhancements, we’d expect to see larger alloy wheels and bigger, performance-orientated brakes. As showcased in the clip, both cars appear to have been designed with a certain degree of off-road capability in mind, despite their performance-orientated nature. It also shows that the X3 M and X4 M benefit from BMW’s latest LED headlight system, too. This range-topping X3 M will slot in above the current X3 M40i M Performance. That car utilises a twin-turbocharged straight-six engine too, but won’t offer as much performance as the full-fat M version. Full pricing for both cars are expected to follow their full reveal at Geneva, but expect them to cost in the region of £60,000.